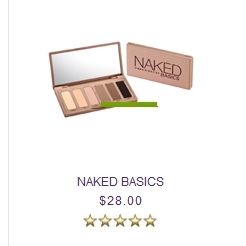 It appears as of April 10, 2014 that Urban Decay has once again increased the prices of their NAKED palettes. Here's the post from Facebook that prompted people to realize that there was another $2 increase to all the NAKED palettes. So why was this done? Honestly? Well my own guess is that someone at L'Oreal, the company that has owned Urban Decay since the fall of 2012, is being greedy. 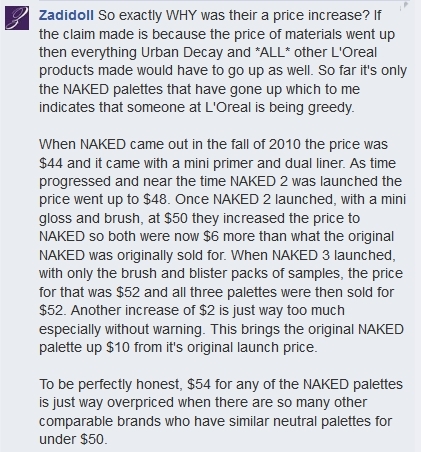 Here's what a representative from Urban Decay had to say about the price increase. Notice that they really didn't say WHY it went up only that they have to "periodically" "raise our prices"? And unlike us, the folks who work for UD get employee discounts so it's not like they ever pay full price to begin with, so that last line about "we get upset" is laughable. Of course you know I'm going to have something to say on the matter so here's my reply to UD's reply. Companies typically will use the "there was a price increase in raw materials" to justify a price increase but when it happens most companies will be apologetic about it and sometimes give fair warning that a price increase is going to happen. If there was an increase in the raw materials used to make products - obviously depending on the ingredients and what product uses what ingredient - then other products would also be increased. Example, let's say that the NAKED palettes were increased due to ingredients or raw materials were increased then you'd also see an increase in other palettes or in the individual shadows. In the last four years since the original NAKED launched in the fall of 2010 the price has gone up almost 25% (an approximate 22.75% increase) while the Basics palette saw less than a 5% increase since it's launch. The individual shadows currently remain at $18. One to two dollars may not seem to be that big of a deal but think about it. The NAKED palettes are still very popular and those one or two dollars multiplied by how many units they sell on the UD site, Sephora, ULTA and other authorized locations means many extra thousands if not millions of dollars for L'Oreal. So what's the real reason for the increase? Will other Urban Decay products go up in price as well? With the increase of the NAKED palettes does this mean another new NAKED palette is coming soon? Last time there was a price increase it was shortly before the release of NAKED2. Of course we'll never really be told the truth since companies don't work that way but it would be nice if UD would give a GOOD explanation on why there was another increase in the NAKED prices. Edit to add: Talking with one of the ladies who reads my Facebook wall, and who actually was the one who alerted me to the price increase, the only way I could justify a price increase is if the factory workers in China (where the brushes are made), USA (where the shadows are made) and/or Dominican Republic (where the palettes are assembled) were given pay raises. If the price increase does directly benefit the factory workers then I can swallow the price increase because it benefits them. Now if it was done strictly for some corporate suit who already makes a six figure salary richer than no, they need to leave the price as it was and stop increasing prices. CS typically has some really good sales and when on sale this palette is usually less than $20 bundled with a bunch of goodies. Links to alternative products are affiliate links. Don't forget the amazing Coastal Scents Revealed palette, which is almost identical to Naked and Naked 2! So disappointing if UD is only raising their prices to increase their profits. I also noticed that the palettes aren't the only ones with a price increase. Last year I bought a 24/7 glider eyeliner for $19 and now they're $20. I'm going for other brands if the prices keep rising with no warning.